“Without a doubt, your seamless siding saved my house,” says Mike Weiss assuredly. He knows a lot about fires. When Mike retired as Lieutenant at the Flint, Michigan Fire Department in 2000, he had served with his squad for 23 years. 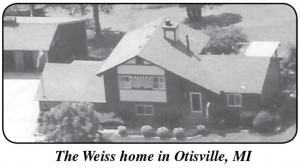 Mike and Grace Weiss moved out to their 10-acre plot in Otisville, 35 minutes from Flint, in 1997. The property was just what they were looking for. A little acreage with an attractive, 4-story house with a fireplace and a big pole barn to store his hobby cars. Mike kept the cedar trim and had his house wrapped in rustic brown ABC Seamless siding after comparing products at the Flint Builders’ show in 1999. “I had re-stained the T-111 (masonite) siding once shortly after we moved in and I wasn’t going to do that again. The house looked great when ABC was done with it.” This was a good choice. It was in early April of this year when Grace had come upstairs to wake Mike after seeing something strange on the patio. She had been letting the cats out when she saw a thin grey square of carbon fall like a leaf to the lawn. The couple had enjoyed a fire in the fireplace earlier and the cedar trim surrounding the fluke exhaust caught fire. As the fire moved toward the roof, it was starved for oxygen by the seamless steel surround. While the siding didn’t entirely choke out the fire, it delayed the spread of the fire long enough that the fire department was able to easily extinguish it when they arrived.